Responsive web design is all the rage at the moment. The theory is that with the plethora of mobile devices you must have a website that looks good on any device it appears on; your web design must respond to the format imposed on it by the size of the device being used. Of course, this is all good in theory. It sounds logical, of course, that you should design a website so that it looks good no matter what device it is used on. That is common sense. However, with millions of websites and billions of resulting web pages not being responsive, mobile users face an uphill battle in trying to use the web effectively on their smartphone, or their iPad for instance. There is a massive amount of pressure on business owners at the moment to make their sites “mobile friendly”. Indeed, web designers are out in force, offering to re-design sites so that they are mobile friendly and responsive. Business owners are sucked into spending money because it all makes sense. Once again, common sense is not always borne out by actual data. It turns out that the overwhelming majority of the time we are on our iPhone or iPads or any other mobile device is spent on entertainment – watching movies, listening to music and so on. The second most popular use of a mobile device is communication – checking messages, sending emails and so on. The research shows finding information, looking up websites and so on, is less than 10% of our activity on mobile devices. It is the least likely thing we are going to do. What this means is that the whole “you must have a responsive website” push is actually about the tiniest proportion of mobile device usage – unless you are in the entertainment or communication business. Clearly, it is sensible to have a website that displays well no matter what device it is used on. However, given that so little of our mobile screen time is spent looking at websites it means that for most businesses this is not the high priority that web designers might make you think. True, they are right – you should do it. But it is a question of priorities – responsive web design may not be the most important factor in boosting your website that you need to attend to. Is Wireless the Trojan Horse in your network? Interesting point, but it does sort of state the obvious. More important for website owners than seeing that most people use their phone or tablet for entertainment and communication, which most people would assume anyway is looking at actual data. You have percentages there, I would be curious to see just how many people that 9% is, how big the sample is, the demographic make up of the sample. A business owner would do better when choosing whether to invest in a responsive website (and it is an investment) by looking at their own analytics figures which should be available to any website owner and see just how much of their traffic is using these devices, does the current traffic level warrant the investment. Then actually do some user testing, ask their website users whether they would like the site to be optimised for a mobile viewing experience. Business decisions based upon data that affects their vertical and business, not a generic survey on how people use their smartphones. Thanks Jim, you make an important point about the need to look at individual analytics and markets. The study I am quoting involved 726 people, but the demographics are not stated (unless you want to buy the full report from the authors at several hundred pounds…!) 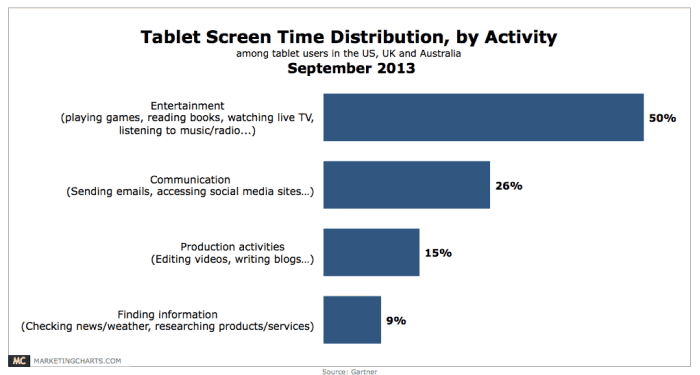 One fact gleaned by the study, however, is that most tablet usage is between 7pm and 10pm, further indicating the entertainment focus of their usage. I don’t agree, though, it states the obvious. In working with many companies what often seems obvious is far from it. Indeed, if it were obvious, businesses would not be as concerned about responsive design as they are. Unfortunately, the statistic you provided does not accurately reflect the situation. The proportion of consumers using their devices for entertainment is irrelevant. It would be like saying we shouldnt worry about desktop users because the majority of the time they aren’t online. The statistic that matters is the percentage of your audience that is coming from mobile. For many sites, this is approaching 30, 40%. Use Google analytics to look at that number, and then you will know whether you need a responsive design or not. Maybe I didn’t explain things as well as I should have. The statistic is not about the numbers of people accessing web via mobile. It is about the number of hours they do so. According to the study only 9% of the total hours spent using a mobile device is spent on information websites. What you say about the numbers of people coming from mobile is true – but even though a site may have 30% of visits from mobile the amount of time is low. Indeed, another study I read recently shows that most people who access emails on their mobiles then re-access the self-same emails on their desktops spending longer looking at them that way. It seems mobiles are used for a “quick check” whilst desktops are still reserved for “proper work”. I don’t think it really matters that the amount of time is low, it’s the fact that they came in the first place. It could be that the amount of time is low and they bounced because your site wasn’t responsive and provided a poor mobile experience? GA would tell you based upon the bounce rate of the traffic coming in from mobile whether the site visitors were engaging, or leaving. Universal analytics will do more to show us people jumping between devices as well, it’s often the case that if people need to use a website and the mobile experience is poor, they’ll jump to another device to do it or leave altogether, and UA will tell you that. It all comes down to your audience, if your audience is using mobile, then you better be damn sure you’re ready to receive them, if they’re not (and in a lot of cases, they’re not, particularly in B2B) it may not be worth the investment at this point, I do agree that people still tend to use desktops for business uses, the stats on the B2B sites I look after certainly support that. Interesting, thanks for the straight up stats. Their justification now appears to be anecdotal at best. It relied on comparing the number of smart phones to computers. It is true that website designing majority thrives on the extend to which one can make a webpage look informative and attractive. Along with it the need of a very good content is required. Good read and nice post.